On Wednesday, July 5, the City of Sarasota Utilities Department “will begin another significant capital improvement project to further strengthen the integrity of the city’s wastewater system and lessen the risk of sewage overflows and spills in our coastal community,” City Manager Tom Barwin has announced. Crews will begin replacing a 50-year-old asbestos cement (AC) sewer force main pipe that runs along Gulfstream Avenue — from McAnsh Square to Cocoanut Avenue — and along Cocoanut Avenue from Gulfstream Avenue to Fourth Street in downtown Sarasota, Barwin reported in his June 23 newsletter. The project is scheduled to be substantially completed by Thanksgiving, Barwin added. “This 24-inch line is a critical part of the city’s wastewater system,” Barwin noted, adding that it carries one-third of the wastewater from downtown Sarasota and the barrier islands to the city’s treatment plant on 12th Street. “With the force main at the end of its expected lifespan, it needs to be replaced,” he pointed out. “Traditional open-cut and directional bore construction will be used, which will present some unavoidable impacts on pedestrian and vehicular traffic,” he added. From July 5 to Aug. 31, Cocoanut Avenue will be partially closed to pedestrians, bicyclists and vehicles between Gulfstream Avenue and Palm Avenue. July 5 to Nov. 15: Eastbound Gulfstream Avenue south of Main Street will be closed. 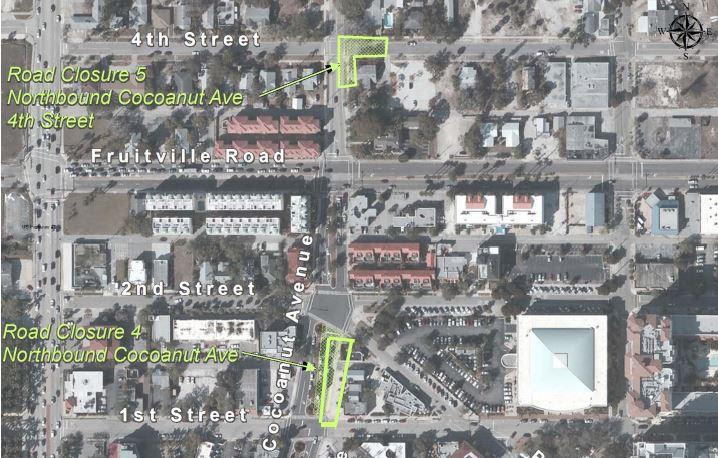 July 24 to Sept. 15: Northbound Cocoanut Avenue will be closed between First Street and Second Street and between Fruitville Road and Fourth Street; eastbound and westbound Fourth Street will be closed east of Cocoanut Avenue. The project also will include streetscape and beautification work on Cocoanut between Gulfstream Avenue and Palm Avenue, he noted.